Austin Andrella is a local builder here in Akron, Ohio. He has won many awards over the past couple of years for his amazing bike builds. 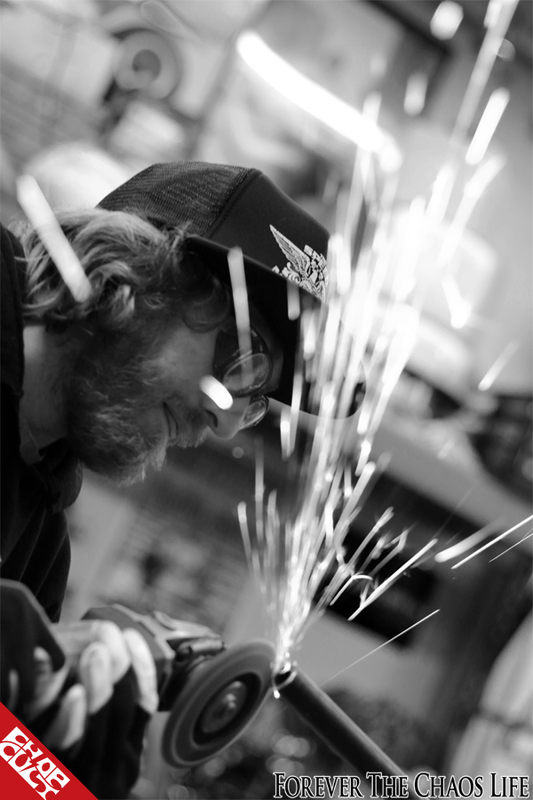 Spending a few hours with him, l grew to know he isn’t just an awarded bike builder; he's a hardworking, blue collar, family man, with three kids and a wonderful wife. He builds bikes. not out of some huge shop with 6 dudes helping him build his vision, but out of an impressive backyard garage that he built himself. He is a genuine, humble, and extremely happy guy that’s always smiling and cracking jokes. 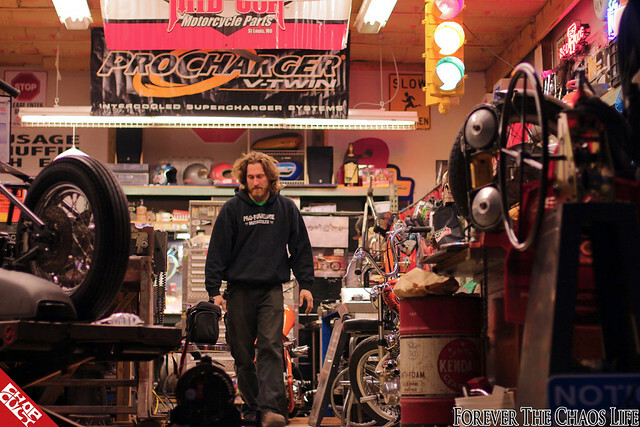 He really just loves what he is doing; taking care of his family and building motorcycles the way he wants to build them. I'm very grateful he asked me to come spend a day at his shop. I learned a lot of things that day, not only about him but the build, tools, and trade. You will be seeing a ton more of bikes coming out of Austin Martin Originals. As long as there is motorcycles in existence you will see his name throughout the builder world! Tell us about Austin Martin Originals. "I started my first build in the basement of my first house. Then, I moved into a house with a mind blowing 2-car garage (lil sarcasm) which I would transform into my make-shift chopper shop equipped with a Handy lift and the bare essentials. About 4 years later, after acquiring a substantial amount of tools and shop junk, I had a tragic fire claiming 90% of my belongings in the garage. So I decided to rise like the phoenix, and rebuild my garage with what I had been able to save and the knowledge I had learned thus far. I built the new shop like a shop should be built with proper height, lighting,and electrical. Then, I strategically placed everything where it needed to go per my sq. footage. A couple things I replaced first were my Handy lift, Miller tig & mig, tube notcher, and tube bender. Later came the frame jig and metal lathe as my passion grew for the two wheels. I wanted to spend money on the proper tools that could make me money to put back into the shop for, of course, more tooling. After 3 years of building the garage, it is filled to the gills, always having a constant flow of 3-5 bikes at all times. Projects ranging from tire swap, to fresh hard tail, to complete builds. 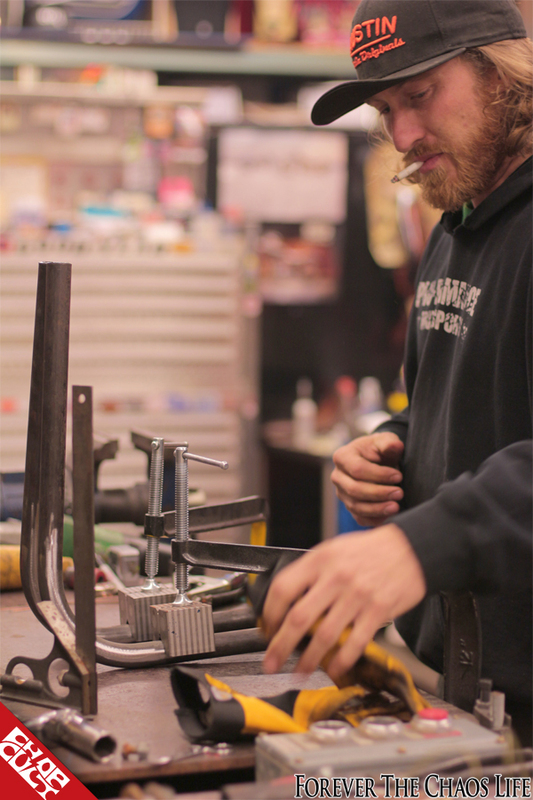 I am self-taught in every aspect of the word custom bike, and still learning day by day. Everything from setting and running my tig welder to shaving fork tubes on my early 50’s South Bend lathe. I pride myself on one off bits for chops at an affordable price for the blue collar guys like myself. By day, I'm a union sprinkler fitter, by night a badass “think outside of the box” fabricator/bike builder. I am a husband and father of three so my plate is always full, and I still manage to put out numerous bikes a year. 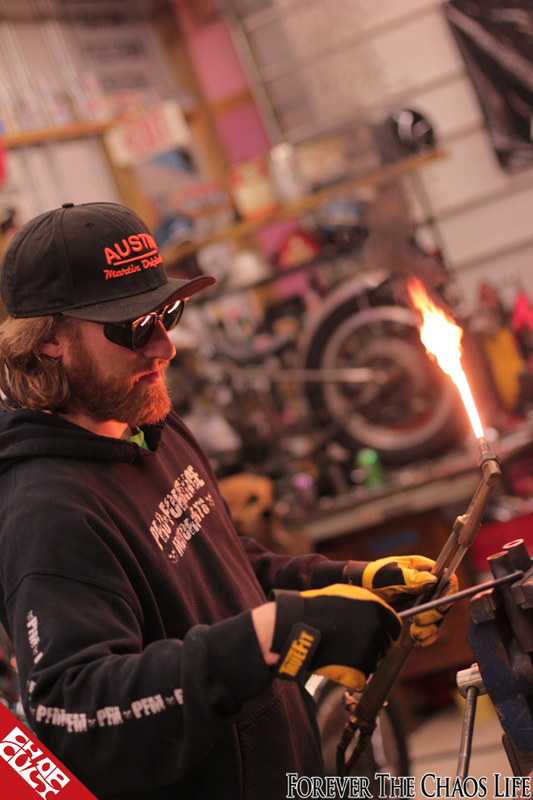 I hand make things such as 7/8” and 1” handlebars, exhaust (mild steel, SS),fender struts and hard tails just to get started. It’s a passion for me to make quality parts that stand out and hold up, no matter the time vested. I love to see the finish product after paint and chrome, just to see the look on the customer's face when it’s all wrapped up. It still blows me away what I can think up and accomplish with my 2 hands. 2013 was a crazy awesome year, I look forward to see how far I can take AMO in 2014! Thanks! I hope you enjoyed my quick bio. Check out Austin's site and give him a follow on Facebook and Instagram. Loved that XS I saw in the Horse awhile back. Keep up the killer work. Austin is a great dude and im pumped to see him working hard and doing good things in our industry. Much respect!